This handbook demonstrates examples of intervention i that illustrate concepts of treatment for children who have special challenges. 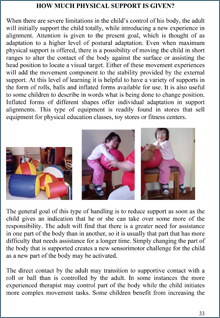 To understand the various reasons for problems in movement control, it is necessary to make some analysis of the personal experiential history of the child. There is a wide range of ability expressed in different children, depending on the cause of their problems. Children who have lived with a neuromotor dysfunction since birth have no memory of movement as being fluid and effortless. The personality of the child will influence his or her determination to express what is an innate biological drive to move. The most important objective for intervention is that each child is developing his or her full potential. 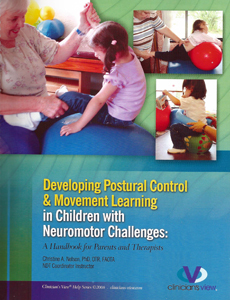 Direct guiding of movement, with intermittent support gives new sensorimotor information to change the kinesthetic and proprioceptive feedback, which stimulates new neural connections that support controlled movement that is closer to normal.